A hand held unit for on the spot noise monitoring. 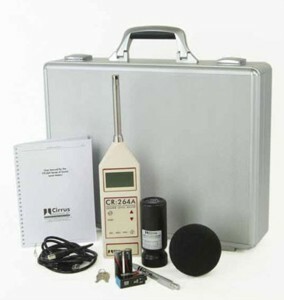 Ideal for Noise at Work assessments and general purpose noise testing. This Sound Level Meter gives you the information needed to make a noise assessment as required by the HSE and is simple to operate. It can also be used for general purpose noise level testing as well as simple boundary noise measurements. Note: The 2005 Control of Noise at Work Regulations require that any persons working in noise levels between 80dB(A) and 85dB(A) must be provided with suitable ear protection on request. Above 85dB(A) then hearing protection must be supplied and worn. Ideal for noise at work assessments.